After another night’s performance of the robotic Willie Wombat Revue at the Willie Wombat Revue Theatre (WWPPT), a mysterious figure, wearing a long black cape, black fedora, white face mask, and known only as the PHANTOM, makes an appearance, terrifying alarmed patrons. An irate Rufus Higby, owner of WWPPT, orders his henchmen to get him. When April reports from the scene, a very nervous Rufus Higby tells her that it was merely a publicity stunt. The Turtles that are watching April’s report down in their lair think Higby’s story is fishy and decide they should investigate. 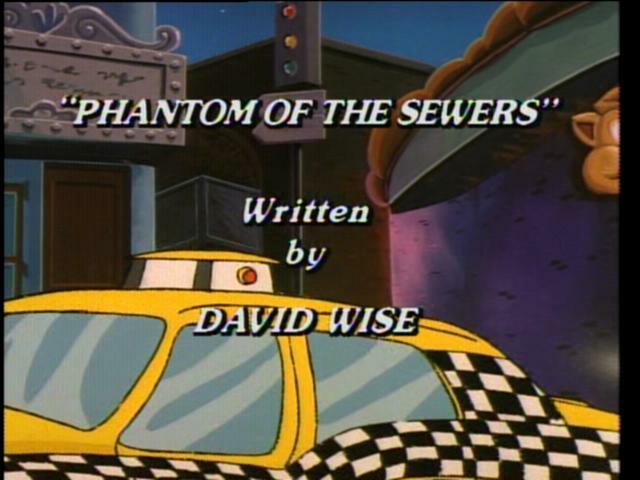 While the Turtles traverse the sewers and remark about how high the underground river seems to be, they encounter the Phantom and give chase, but ultimately lose him. Later, with the aid of a tracking device, the TMNT are able to locate the Phantom’s lair. It appears that the Phantom has opened all the flood gates and is generating hydroelectric energy — but to what end? After evading numerous traps rigged by the Phantom, the Turtles are able to successfully close the floodgates… but they still haven’t found the Phantom. While investigating the area, the Turtles find an elevator under the foundation of a building that leads them up inside the WWPPT where they encounter Rufus Higby. 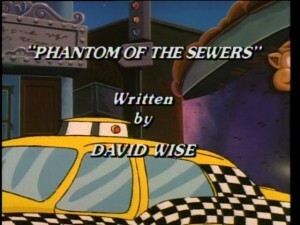 He still denies the existence of the Phantom. The Turtles rush over to Channel Six. April has been busy reporting on the break-ins of over forty banks city wide. In each break in, someone or something literally ripped the vault doors off their hinges. The Turtles decide they should enter the investigation as well. Over at the Cityville Bank, one of the few banks that was not robbed the night before, the Turtles stand guard. But not for long, because they are about to encounter whatever was strong enough to rip through six inches of solid steel — The Willie Wombat Pizza Pan Theatre Robots!! April contacts the Turtles via the TurtleCom to inform them that Rufus Higby had a partner named Bogart Flywheel who invented and designed all the robots. After a fall out with Higby three months ago, Flywheel vanished without a trace. The Turtles are now convinced that The Phantom/Bogart Flywheel is behind all the bank robberies and head back into the sewers to find him. Once they encounter the Phantom, and hear a tale of woe, the mutant lads soon realize that he is not responsible for the robberies, but rather his ex-partner Rufus Higby is. After a battle, which destroys all of Bogart Flywheel’s “children” and causes the WWPPT building to fall into the sewers below, the Phantom discovers that his face is not hideously disfigured after all and he can resume a normal life.